I hate the automatic saving and versioning in Mac OS X Lion. Is there a way to completely turn it off? I intentionally was searcing for hidden defaults1 and fortuitously stumbled across a defaults setting that disables Auto Save, Versions and Resume, all at once. Replace preview with the name of whatever app you wish to perform this on. I can confirm that this works for TextEdit, Preview, Automator and Safari (for disabling Resume), but it should also work for other Apple applications like iWork, Xcode, iPhoto etc. It also works for some, but not all, third party applications. My machine hasn't gone up in flames (joking again) but as long as you have a good backup system, these settings seem stable to change and test. Another option, is a TextEdit fork called "TextEdit+", that thankfully isn't sandboxed (surprisingly, TextEdit is actually open source). It can be downloaded here. Disabling ApplePersistence also restores Save As in most apps, except in Preview, iWork and maybe some others. In those cases you can use the Export… menu item instead. This is almost identical to Save As, except that you have to manually open the document after saving it. Just assign Command-Shift-S to Export… in these applications, and you'll get something very similar to Save As there too. 1 Thanks to Lri for his excellent one-liner for finding hidden defaults settings. There is a much much simpler way to do it that was only introduced in OS X 10.8 Mountain Lion. 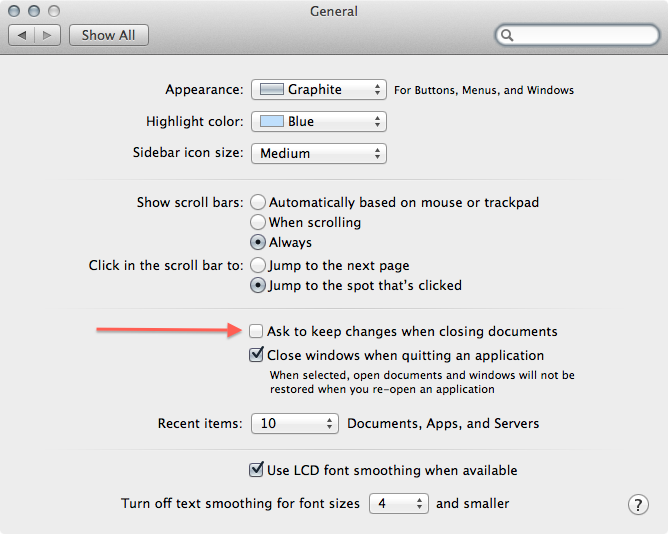 According to this post, you just have to enable System Preferences > General > Ask to keep changes when closing documents. The only thing I found so far is checking the size of the Versions folder /.DocumentRevisions-V100 and deleting it if I think it takes up too much space. But that creates a big mess, leaving you unable to re-save documents in Apps featuring "Versions & Autosave"
Not a satisfying solution. I really hope someone finds a way to turn it off or that one of the next OS X updates gives the user more control. Hackinations: 5 really good Lion tweaks mentions that the switch NSDocumentAutosaveOldDocumentDayThreshold could be used to tweak autosave but I couldn't find any details about its function. And it seems the deamon /System/Library/PrivateFrameworks/GenerationalStorage.framework/Versions/A/Support/revisiond is responsible for creating the versions - if you rename or move it and restart, "Versions" no longer functions but this is a bad idea again as all processes that depend on that deamon run into serious troubles. Anyone with better ideas ? Careful, this comes with absolutely no warranty and may break your system! That (probably) means that your document will still be automatically saved in certain intervals, but once you close it (or the program) you can only retrieve the latest version (and Time Machine backups, if available). Versions (especially of Autosave) may still end up in ~/Library/Containers as nicely described in this answer. What to do: install OnyX / Close all apps that are running / Open Onyx - it asks to run a disk check, press ok / It will look like it has frozen but it's not / Then select tab Cleaning / Then Select tab Misc. / Then check option: Automatically saved versions of documents / Press enter / Tada! Not the answer you're looking for? Browse other questions tagged lion versions autosave . Can revisions, auto save and versions be completely and permanently neutered from OS X? Is there a way to turn off autosave feature in Lion OS X? 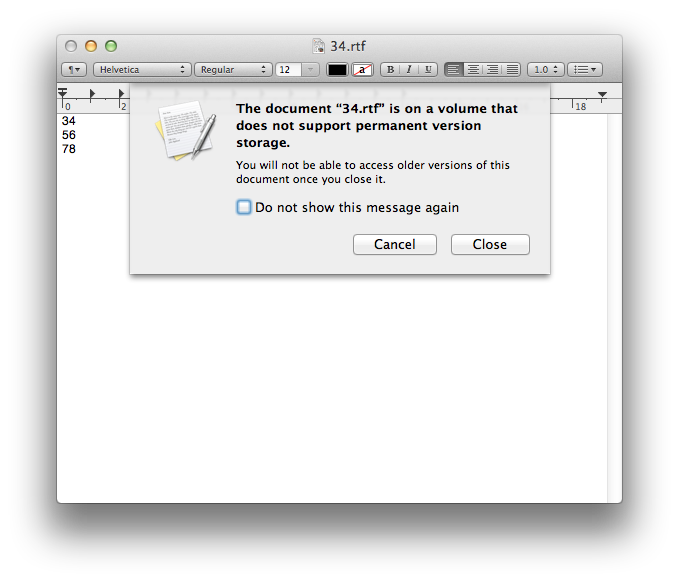 How can I prevent TextEdit from saving previous versions of a text file? Is it possible to disable Versions for all applications? Can I change how often Lion's “Versions” feature saves files? How to default to “Not open all the apps again” on Mac OS X Lion? How do I find hidden UIScrollView settings in Safari and Lion? Dreamweaver tells me that it can't edit some html file because it is locked, how to exclude folders/types from auto lock?